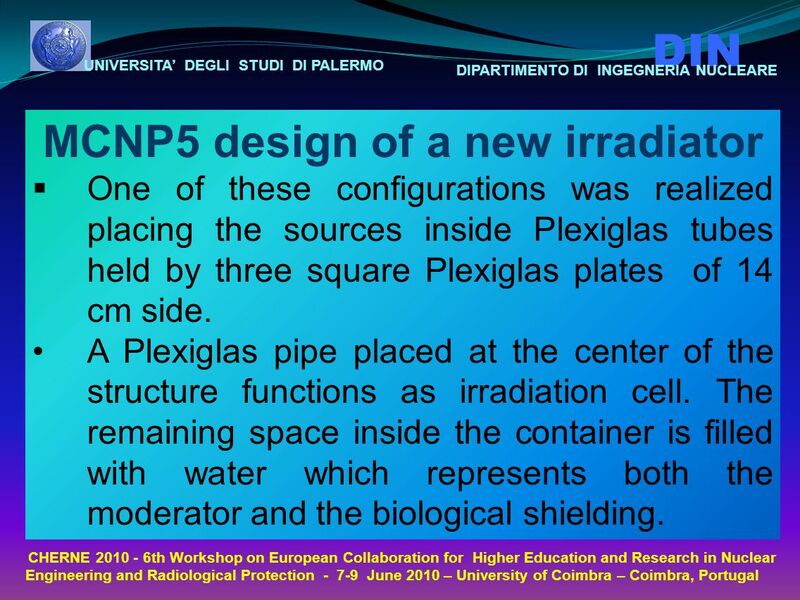 UNIVERSITA’ DEGLI STUDI DI PALERMO DIN DIPARTIMENTO DI INGEGNERIA NUCLEARE CHERNE 2010 - 6th Workshop on European Collaboration for Higher Education and. 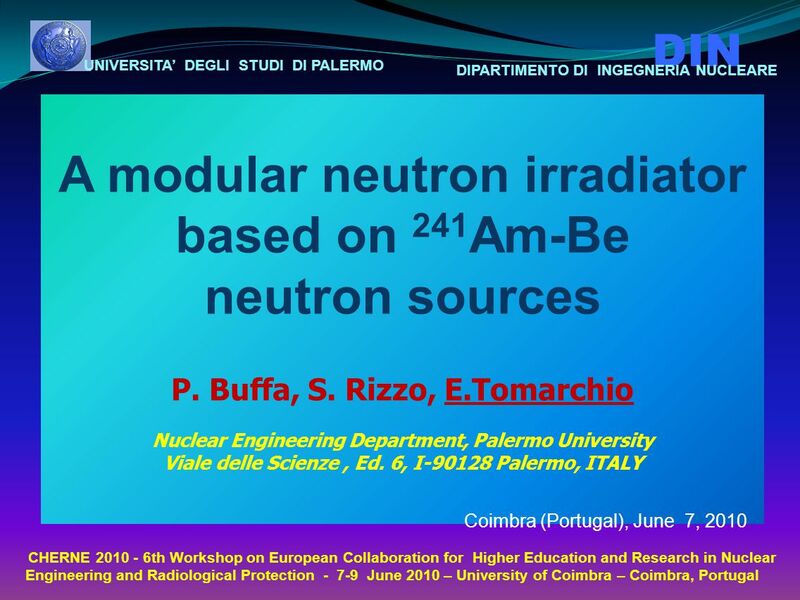 2 UNIVERSITA’ DEGLI STUDI DI PALERMO DIN DIPARTIMENTO DI INGEGNERIA NUCLEARE CHERNE 2010 - 6th Workshop on European Collaboration for Higher Education and Research in Nuclear Engineering and Radiological Protection - 7-9 June 2010 – University of Coimbra – Coimbra, Portugal Introduction Neutron irradiator facilities with 241 Am-Be sources are worldwide used in order to perform neutron activation analysis (NAA), to investigate materials in different research areas or to test and calibrate neutron detectors and environmental or personal dosemeters. 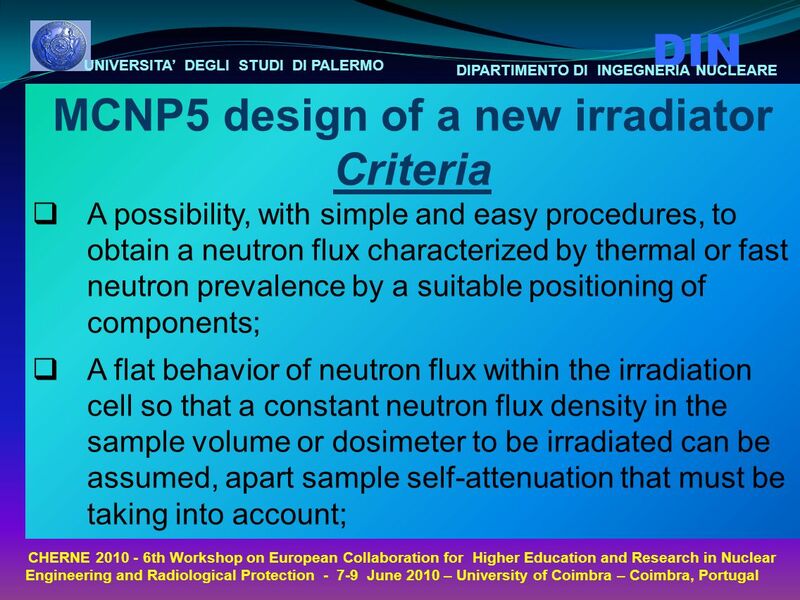 The use of a neutron irradiator is advantageous because of its very stable neutron flux, even it is many orders of magnitude lower than the one of a nuclear reactor or a particle accelerator. 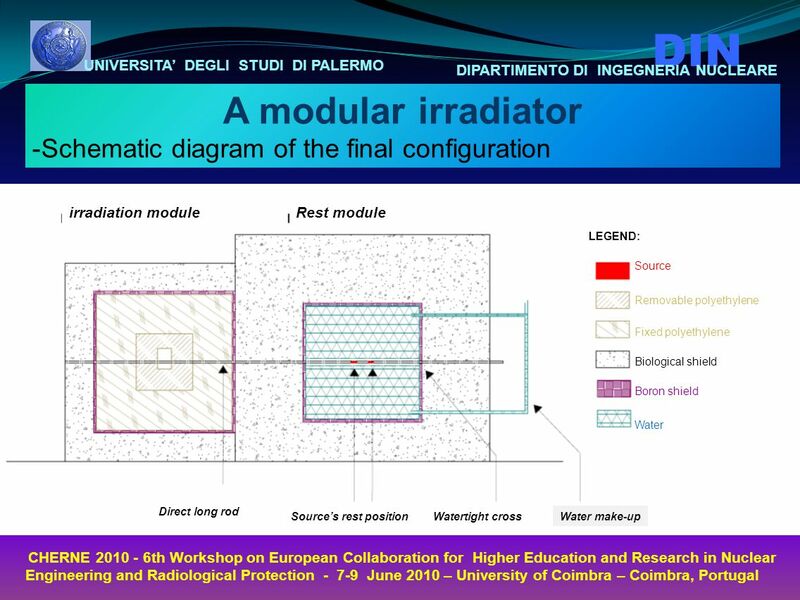 3 UNIVERSITA’ DEGLI STUDI DI PALERMO DIN DIPARTIMENTO DI INGEGNERIA NUCLEARE CHERNE 2010 - 6th Workshop on European Collaboration for Higher Education and Research in Nuclear Engineering and Radiological Protection - 7-9 June 2010 – University of Coimbra – Coimbra, Portugal Introduction Most of irradiators are realized with neutron sources located at fixed positions and accordingly the characteristics of neutron spectrum previously assessed do not change. 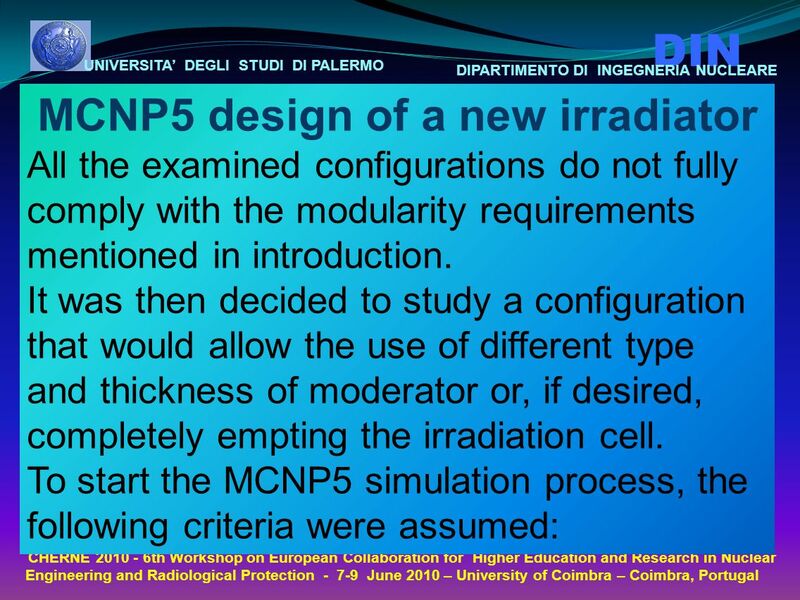 Therefore, an interesting choice is to have a modular facility, capable of varying conditions of irradiation and setting the prevalence of fast or thermal neutron spectrum component. 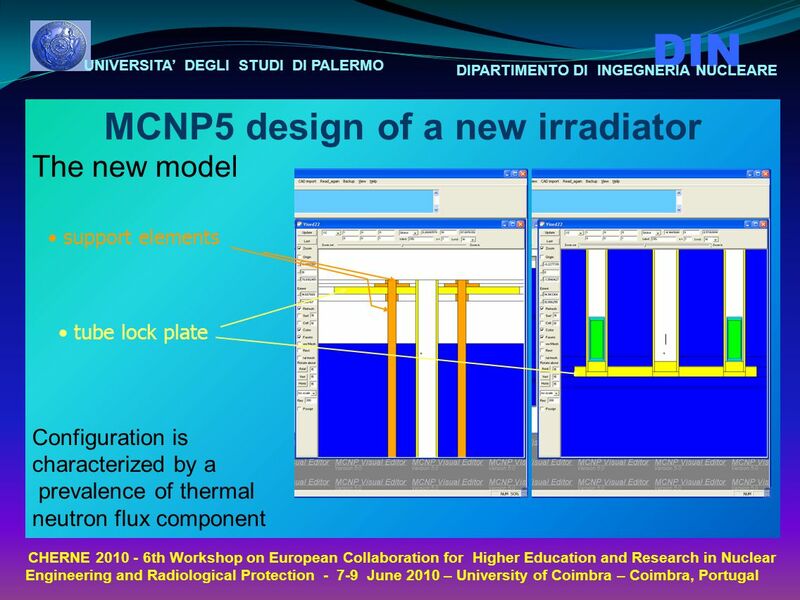 4 UNIVERSITA’ DEGLI STUDI DI PALERMO DIN DIPARTIMENTO DI INGEGNERIA NUCLEARE CHERNE 2010 - 6th Workshop on European Collaboration for Higher Education and Research in Nuclear Engineering and Radiological Protection - 7-9 June 2010 – University of Coimbra – Coimbra, Portugal Introduction In this work we describe the design and the realization process of a new modular 241 Am-Be neutron irradiator in order to obtain a neutron energy distribution useful to test neutron detectors or personal dosemeters. 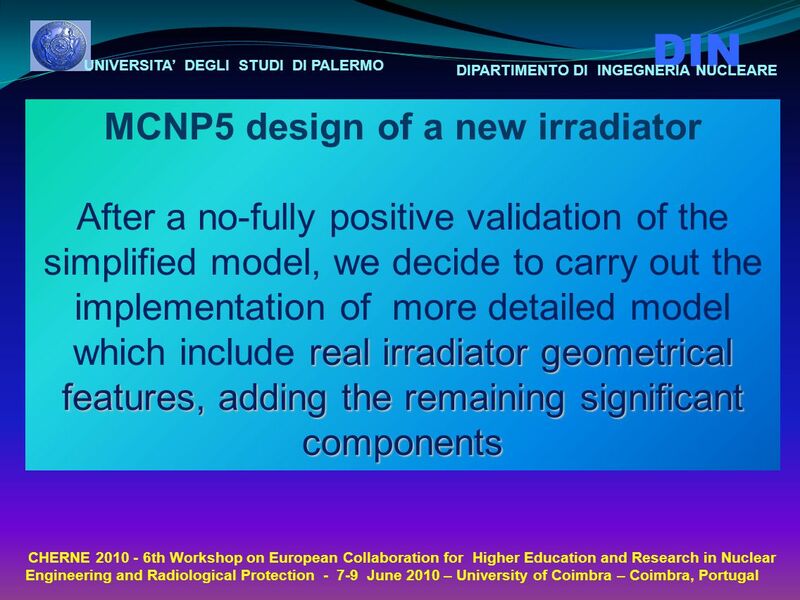 Some of the useful calculations oriented to optimize thicknesses and shape of the moderators and shielding materials were obtained with a Monte Carlo simulation with MCNP5 code. 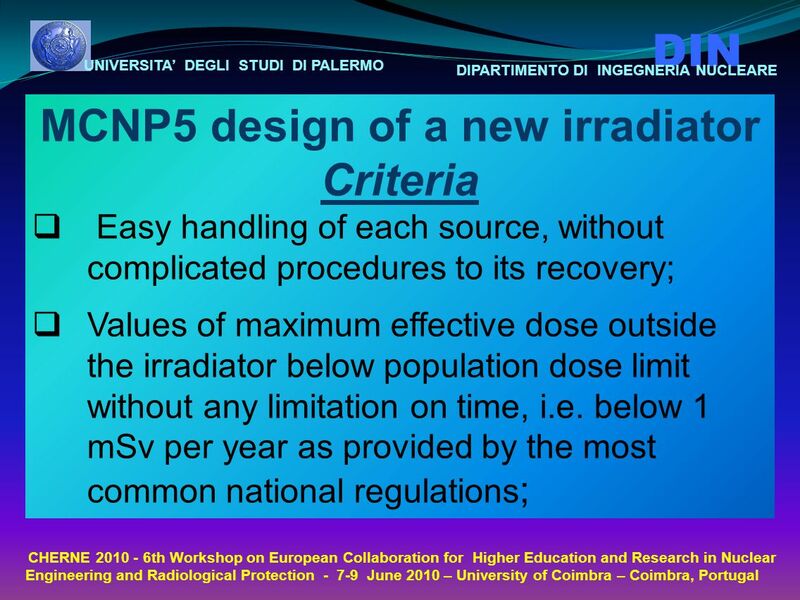 5 UNIVERSITA’ DEGLI STUDI DI PALERMO DIN DIPARTIMENTO DI INGEGNERIA NUCLEARE CHERNE 2010 - 6th Workshop on European Collaboration for Higher Education and Research in Nuclear Engineering and Radiological Protection - 7-9 June 2010 – University of Coimbra – Coimbra, Portugal MCNP5 design of a new irradiator The results of the simulations conduct to neutron flux values (F4 Tally) or to dose (F6 Tally). The neutron flux was estimated using the tally F4 (cm - 2 ), which calculates the average flux over a cell (particles·cm -2 ). 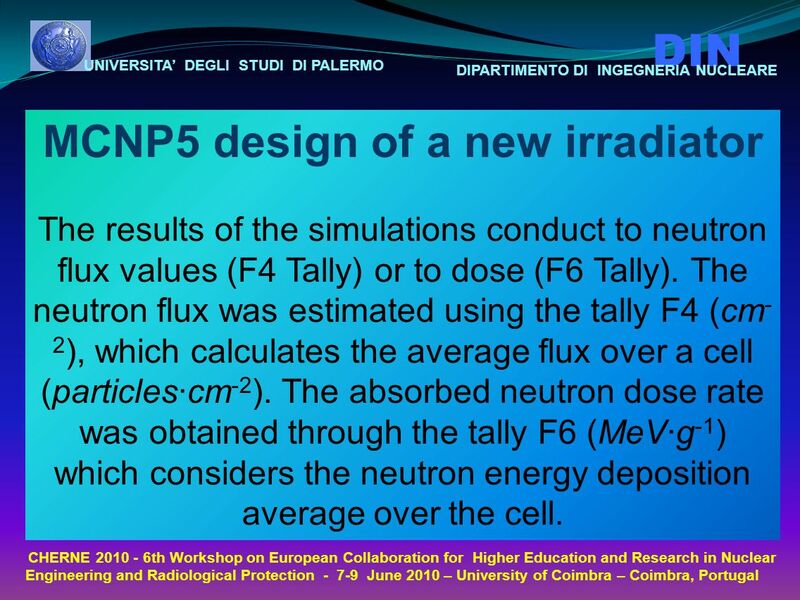 The absorbed neutron dose rate was obtained through the tally F6 (MeV·g -1 ) which considers the neutron energy deposition average over the cell. 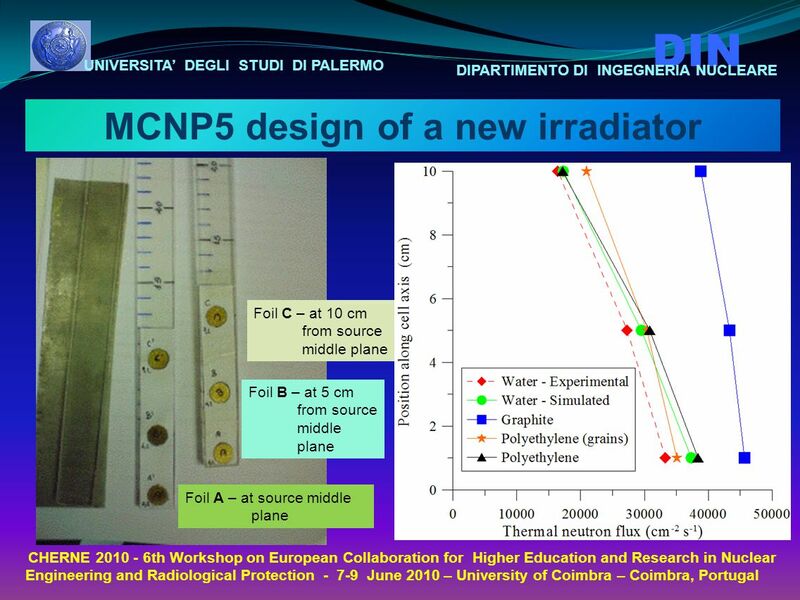 6 UNIVERSITA’ DEGLI STUDI DI PALERMO DIN DIPARTIMENTO DI INGEGNERIA NUCLEARE CHERNE 2010 - 6th Workshop on European Collaboration for Higher Education and Research in Nuclear Engineering and Radiological Protection - 7-9 June 2010 – University of Coimbra – Coimbra, Portugal MCNP5 design of a new irradiator The intervals of energy considered were: -thermal below the Cadmium cutoff energy (<0.5 eV); two epithermal neutron groups (between 0.5 eV and 0.1 MeV, 0.1 MeV and 0.3 MeV); -three fast neutron groups (0.3 MeV to 1 MeV, from 1 MeV to 5 MeV, and above 5 MeV). 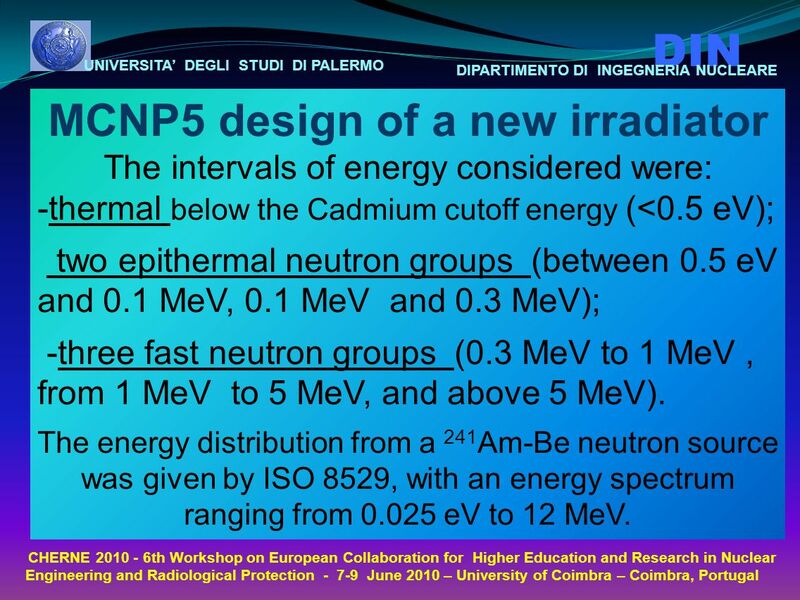 The energy distribution from a 241 Am-Be neutron source was given by ISO 8529, with an energy spectrum ranging from 0.025 eV to 12 MeV. 7 UNIVERSITA’ DEGLI STUDI DI PALERMO DIN DIPARTIMENTO DI INGEGNERIA NUCLEARE CHERNE 2010 - 6th Workshop on European Collaboration for Higher Education and Research in Nuclear Engineering and Radiological Protection - 7-9 June 2010 – University of Coimbra – Coimbra, Portugal MCNP5 design of a new irradiator Several geometry configurations are considered: 1)A first simple model, with a neutron source sited at the center of a sphere-shaped moderator of various diameter 2)Four 241 Am-Be sources placed at the edges of a parallepiped Plexiglas structure surrounded by various materials : the sources was more realistically modeled as a cylinder shape of 43 mm lenght and about 20 mm in diameter, coated with a metallic alloy. 8 UNIVERSITA’ DEGLI STUDI DI PALERMO DIN DIPARTIMENTO DI INGEGNERIA NUCLEARE CHERNE 2010 - 6th Workshop on European Collaboration for Higher Education and Research in Nuclear Engineering and Radiological Protection - 7-9 June 2010 – University of Coimbra – Coimbra, Portugal MCNP5 design of a new irradiator  One of these configurations was realized placing the sources inside Plexiglas tubes held by three square Plexiglas plates of 14 cm side. 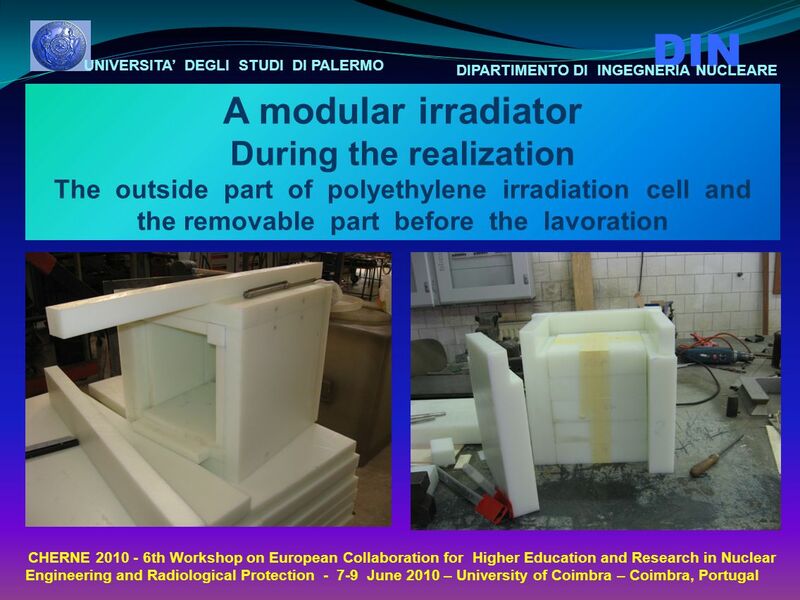 A Plexiglas pipe placed at the center of the structure functions as irradiation cell. The remaining space inside the container is filled with water which represents both the moderator and the biological shielding. 17 UNIVERSITA’ DEGLI STUDI DI PALERMO DIN DIPARTIMENTO DI INGEGNERIA NUCLEARE CHERNE 2010 - 6th Workshop on European Collaboration for Higher Education and Research in Nuclear Engineering and Radiological Protection - 7-9 June 2010 – University of Coimbra – Coimbra, Portugal MCNP5 design of a new irradiator Criteria  Installation flexibility, with the possibility of irradiation of samples of various sizes and also to test individual dosimeters placed on anthropomorphic phantoms. 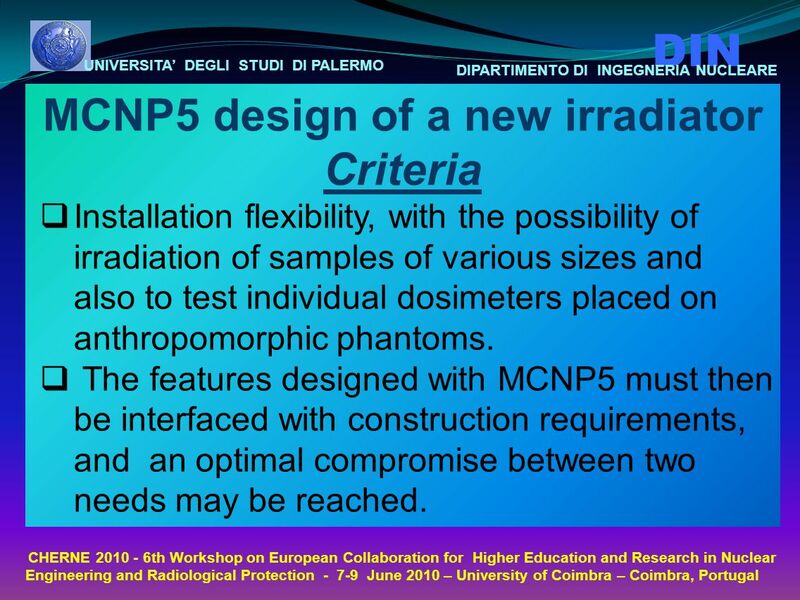  The features designed with MCNP5 must then be interfaced with construction requirements, and an optimal compromise between two needs may be reached. 18 UNIVERSITA’ DEGLI STUDI DI PALERMO DIN DIPARTIMENTO DI INGEGNERIA NUCLEARE CHERNE 2010 - 6th Workshop on European Collaboration for Higher Education and Research in Nuclear Engineering and Radiological Protection - 7-9 June 2010 – University of Coimbra – Coimbra, Portugal MCNP5 design of a new irradiator Monte Carlo Simulation To draw up the final draft, several tests were made with MCNP5 simulations (more of 100 runs, the minimum number of stories examined for each test: 1  10 8, total processing time not less than 1200 h taking into account the time needed for different personal computers). 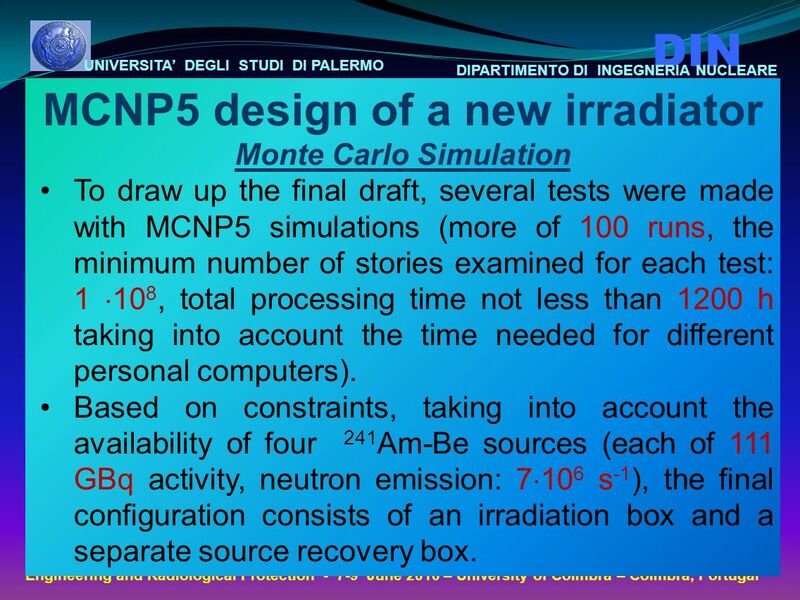 Based on constraints, taking into account the availability of four 241 Am ‑ Be sources (each of 111 GBq activity, neutron emission: 7  10 6 s -1 ), the final configuration consists of an irradiation box and a separate source recovery box. 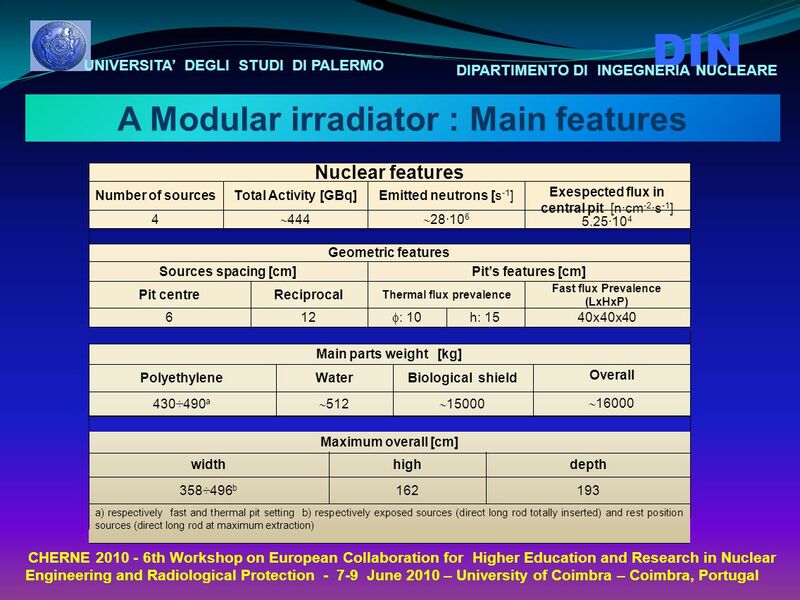 20 UNIVERSITA’ DEGLI STUDI DI PALERMO DIN DIPARTIMENTO DI INGEGNERIA NUCLEARE CHERNE 2010 - 6th Workshop on European Collaboration for Higher Education and Research in Nuclear Engineering and Radiological Protection - 7-9 June 2010 – University of Coimbra – Coimbra, Portugal A modular irradiator  Irradiation cell is obtained at the center of a polyethylene cube designed so that it is possible to change its geometrical configuration to generate fast or thermal neutron fluxes, and may easily be equipped with filters (or material suitable for conversion). 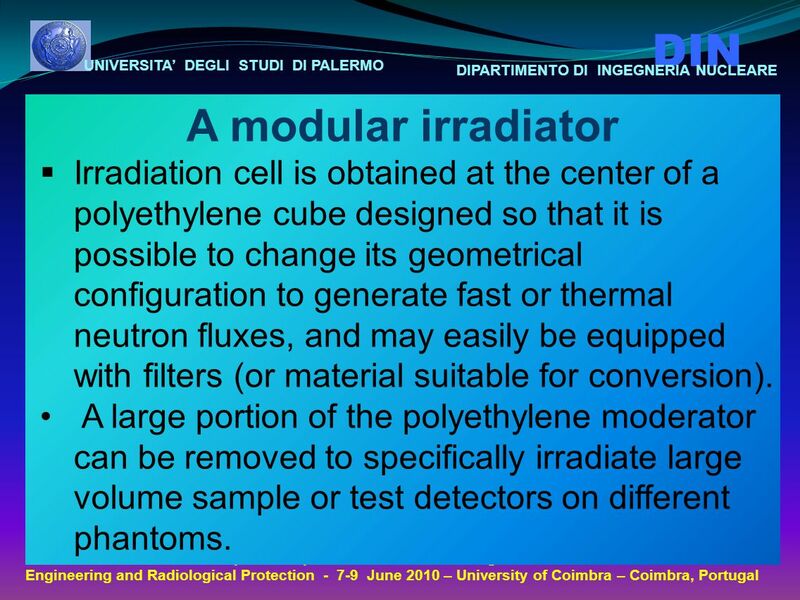 A large portion of the polyethylene moderator can be removed to specifically irradiate large volume sample or test detectors on different phantoms. 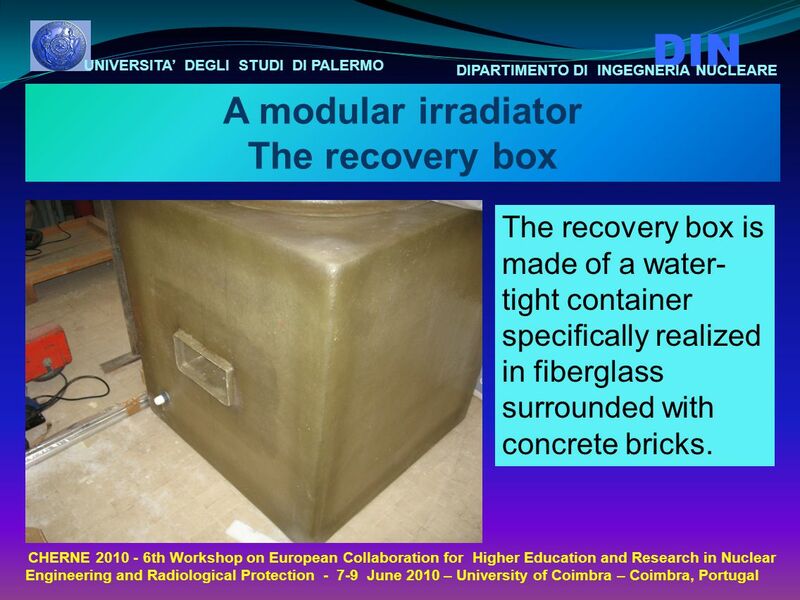 27 UNIVERSITA’ DEGLI STUDI DI PALERMO DIN DIPARTIMENTO DI INGEGNERIA NUCLEARE CHERNE 2010 - 6th Workshop on European Collaboration for Higher Education and Research in Nuclear Engineering and Radiological Protection - 7-9 June 2010 – University of Coimbra – Coimbra, Portugal A modular irradiator The recovery box The recovery box is made of a water- tight container specifically realized in fiberglass surrounded with concrete bricks. 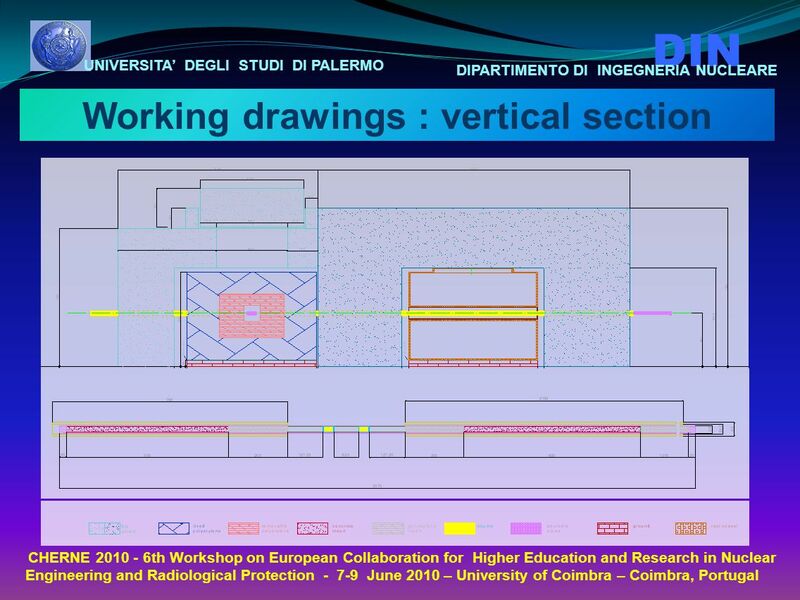 28 UNIVERSITA’ DEGLI STUDI DI PALERMO DIN DIPARTIMENTO DI INGEGNERIA NUCLEARE CHERNE 2010 - 6th Workshop on European Collaboration for Higher Education and Research in Nuclear Engineering and Radiological Protection - 7-9 June 2010 – University of Coimbra – Coimbra, Portugal In progress activities  The irradiation assembly is nearing completion;  The sources must be transferred into the rest module;  A comparison between simulate and experimental flux values will carry out by means of bubble detectors, bubble spectrometry system (BDS), TLD detectors and so on. 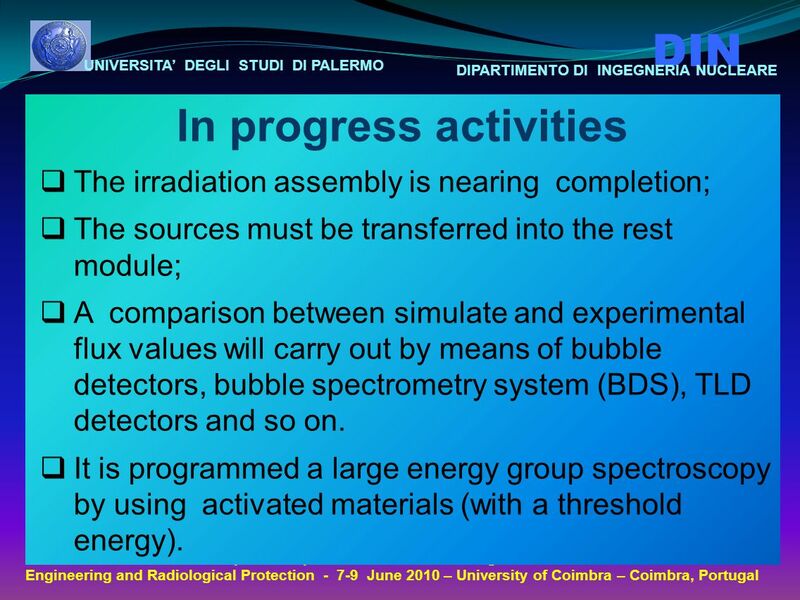  It is programmed a large energy group spectroscopy by using activated materials (with a threshold energy). 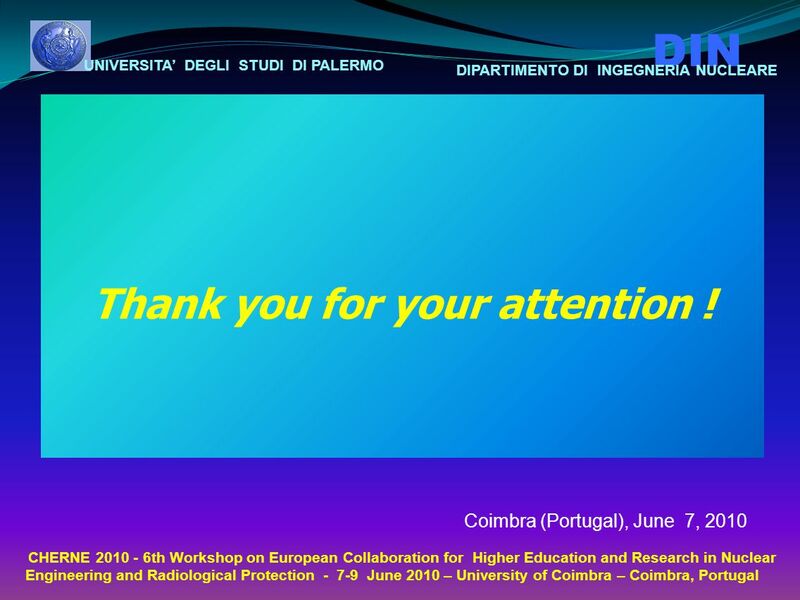 29 UNIVERSITA’ DEGLI STUDI DI PALERMO DIN DIPARTIMENTO DI INGEGNERIA NUCLEARE CHERNE 2010 - 6th Workshop on European Collaboration for Higher Education and Research in Nuclear Engineering and Radiological Protection - 7-9 June 2010 – University of Coimbra – Coimbra, Portugal What do we expect? 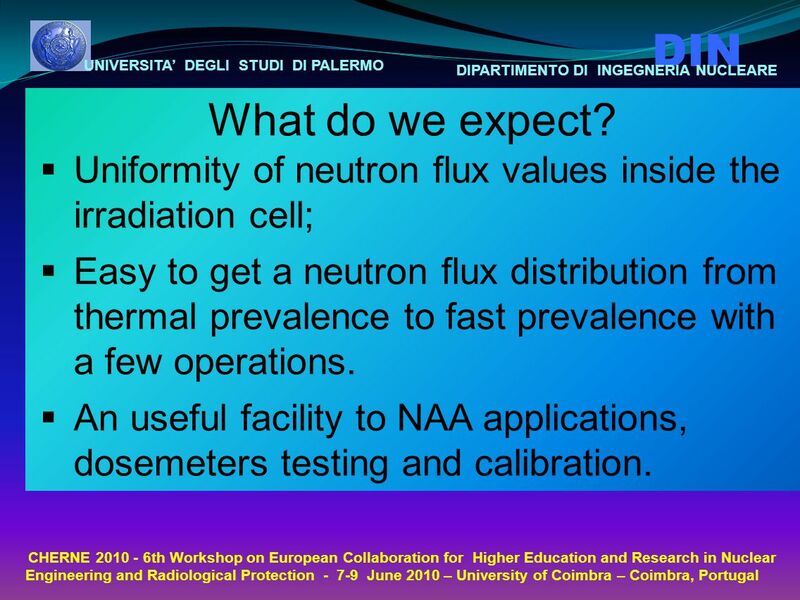  Uniformity of neutron flux values inside the irradiation cell;  Easy to get a neutron flux distribution from thermal prevalence to fast prevalence with a few operations.  An useful facility to NAA applications, dosemeters testing and calibration. 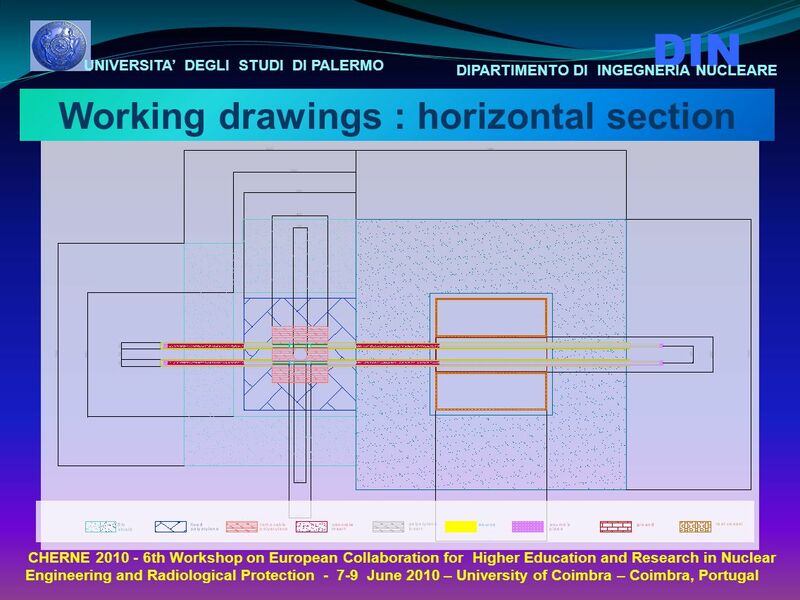 30 UNIVERSITA’ DEGLI STUDI DI PALERMO DIN DIPARTIMENTO DI INGEGNERIA NUCLEARE CHERNE 2010 - 6th Workshop on European Collaboration for Higher Education and Research in Nuclear Engineering and Radiological Protection - 7-9 June 2010 – University of Coimbra – Coimbra, Portugal Conclusions Monte Carlo simulation is confirmed as an useful technique to study neutron irradiators with different configurations and to preliminary assess the characteristics of neutron flux originating from various sources. 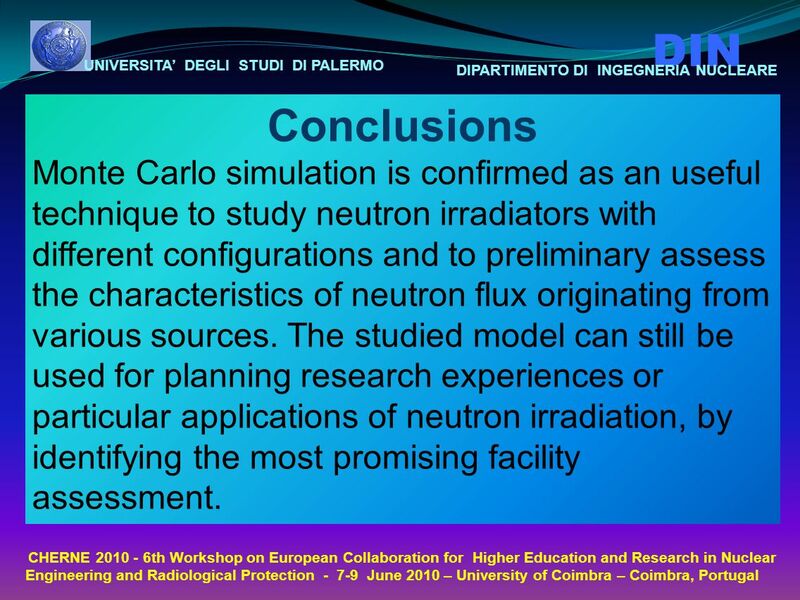 The studied model can still be used for planning research experiences or particular applications of neutron irradiation, by identifying the most promising facility assessment. 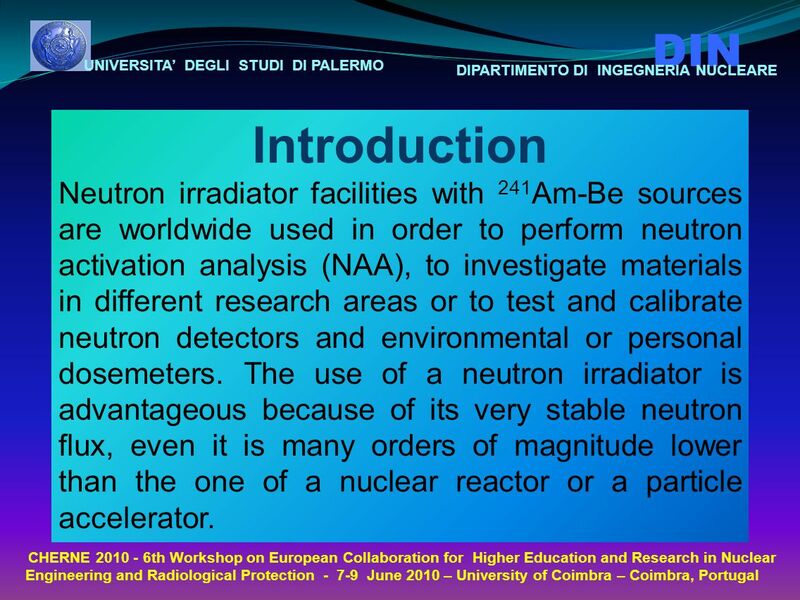 Download ppt "UNIVERSITA’ DEGLI STUDI DI PALERMO DIN DIPARTIMENTO DI INGEGNERIA NUCLEARE CHERNE 2010 - 6th Workshop on European Collaboration for Higher Education and." V.4 AEROSOL LIDAR MEASUREMENTS Vincenzo Rizi CETEMPS Dipartimento di Fisica Università Degli Studi dellAquila Italy V.3 AEROSOL. 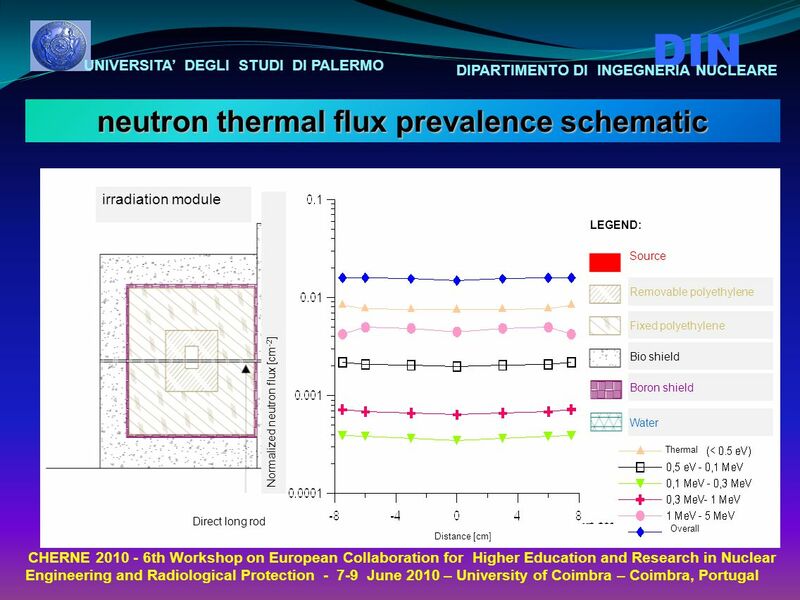 UNIVERSITA’ DEGLI STUDI DI PALERMO DIN DIPARTIMENTO DI INGEGNERIA NUCLEARE CHERNE th Workshop on European Collaboration for Higher Education and. 16 th ICNCT June 14-19, 2014 Helsinki, Finland Design and simulation of an optimized photoconverter for e-linac based neutron source for BNCT research. Esteban Fabián Boggio 1 Lucas Provenzano 2 Sara Gonzalez 2,3 Sara Gonzalez 2,3 Juan Manuel Longhino 1 1 Bariloche Atomic Center, Atomic Energy National. 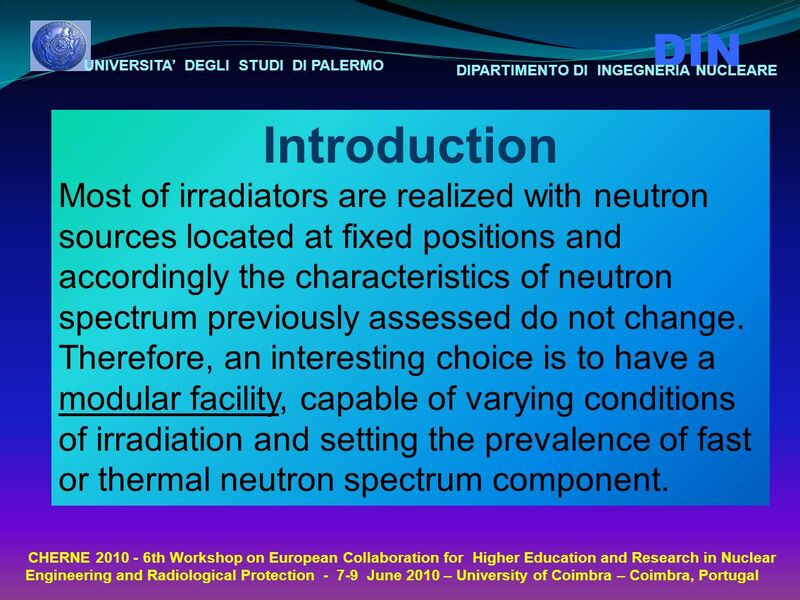 Energy deposition and neutron background studies for a low energy proton therapy facility Roxana Rata*, Roger Barlow* * International Institute for Accelerator. Student Practice in JINR Fields of Research Dubna Vlasta Zdychová, Martina Benešová CTU in Prague Czech Republic Pavol Blahušiak, Alexander. Feasibility of a Small Scale Transmutation Device – Part 1 Conceptual Design only Roger Sit NCHPS Meeting Charlotte, NC October 22-23, 2009. 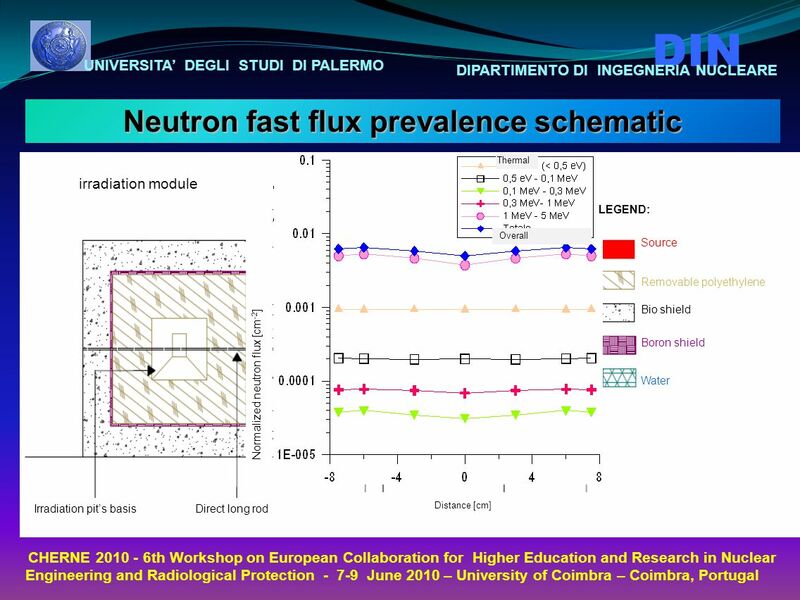 Neutronic simulation of a European Pressurised Reactor O.E. Montwedi, V. Naicker School of Mechanical and Nuclear Engineering North-West University Energy. 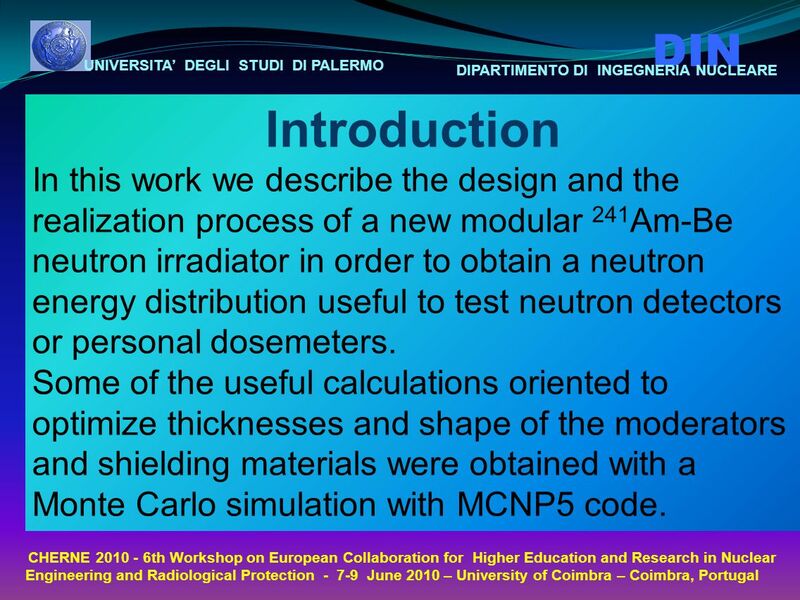 Estimation of the effects of a lead vest on dose reduction for NPP workers using Monte Carlo calculations KIM JEONG-IN. K. Oishi, K. Kosako and T. Nakamura Institute of Technology, Shimizu Corporation, Japan id=17 SATIF-10. MARS15 Simulations of the MERIT Mercury Target Experiment Fermilab March 18, Neutrino Factory and Muon Collider Collaboration meeting Sergei. 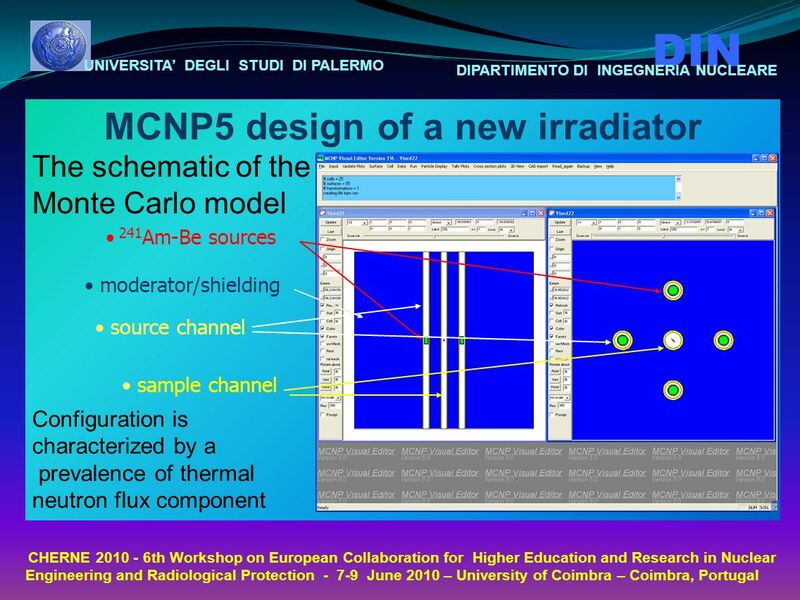 Radiation Physics Beam Tests J. Bauer, J. Liu, L. Nicolas, S. Rokni, M. Santana ESTB Workshop 2011 March 17, 2011. Setup for large area low-fluence irradiations with quasi-monoenergetic 0.1−5 MeV light ions M. Laitinen 1, T. Sajavaara 1, M. Santala 2 and Harry J. Whitlow. 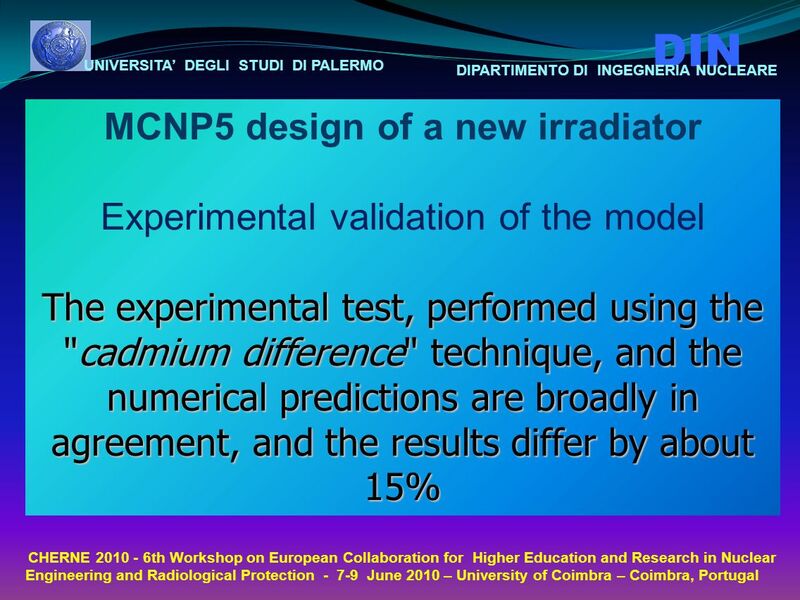 MONTE CARLO RADIATION DOSE SIMULATIONS AND DOSIMETRY COMPARISON OF THE MODEL 6711 AND I BRACHYTHERAPY SOURCES Mark J. Rivard Department of Radiation. 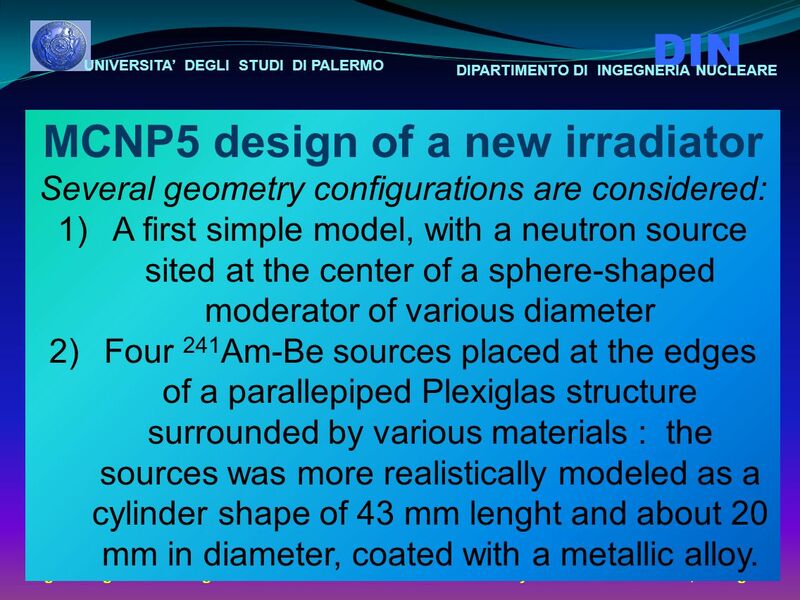 Design on Target and Moderator of X- band Compact Electron Linac Neutron Source for Short Pulsed Neutrons Kazuhiro Tagi.